This is an interesting post. There are two sides to everything. My mother works for a small insurance company (about 50-55 people in the company) and all employees are offered a company laptop. The company also promotes telecommuting. The company laptops come equipped with the software required to access the company network and other necessary software to work from home but still be connected. The employees who do not have the company laptop needed to install the software on their computer in order to work from home. Those who opted to use their personal computer had many problems downloading the software and learning how to set it up, so they needed to bring the device into the office to have IT figure it out for them. However, there have been some instances where employees have forgotten their work laptop and did not save their work to the universal network, so they needed to either waste time going home to get it, or they needed to redo the work in the office. Employees were also given the option to have their personal phone linked to their office phone. The idea was if they were away from their desk and their phone rang, instead of going to voicemail it would transfer to their personal phone so they could be reachable anywhere. They could have hours set up where it would not switch to their personal phone (non-office hours for example), but most people opted out because they thought it was too much access than what they wanted. It will be interesting to see how BYOD transitions in the future, specifically to compare the corporate managers’ views to the employee’s views. Because the company I used is small, the culture and attitudes could be very different from a larger company. I think this is a great idea. At the previous company I was at, we were still using computers from the early 2000’s with no chance of an upgrade. This prolonged many of my assignments and did not allow me the freedom to roam the office or even work from home. I am also more comfortable with using Mac Computers, and the only department that received those computers was the IT department. Not only could this BYOD save a lot of money, but it would make employees more efficient, leave less room for errors, and also provide comfort and mobility. Ive seen some companies already transition into this way of operation. My only concern is security for the company. I personally do not like the idea of using a personal device for work. I feel that the company should be providing the technology that is used. I would not want to combine my personal computer with work from the office. However, I do like the idea of being able to connect and get work done from any location. I do see how companies see many positives with letting employees use their own devices. I am sure that it will cut costs and its great that employees will not have to consistently learn a new system, since they can upgrade whenever they like. However, I also see an issue with this because many employees may keep their old devices and not upgrade which means that these devices will be running slow. 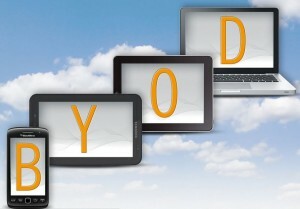 This means that the company will lose productivity and efficiency if employees are not always upgrading their devices. Upgrading technology is expensive and employees may not want to spend money from their paychecks in order to upgrade their devices. The only way i would bring my own electronic devices to work is if the company were to pay for them. I’m not going to spend my own money and be forced to use it at work. if the company looses productivity because their computers are slow that isn’t my problem, its theirs. i’ll go grab a coffee while the file loads. It saved the company money sure, but if its my device i don’t want the company to see what i am using it for. Great topic! At the company I currently intern at, you can connect your device to your work. The only thing is that it has to be a device they provide (usually a blackberry) and they have the right to look through it and check everything you have on there. What most employees do then is have the company phone and their own on the side, this allows them to keep their personal lives on the phone they get themselves. I personally feel that if the company were to let employees use their own phone then it would be less productive. It gives them more reasons to be on their phones while at work and mix personal business with company business. Yes it would save them money but do they want to risk an employee not having the latest update and that leading to less productive work?